Crystal Brook is a cosy single-storey modern house, offering a warm welcome, in a relaxing atmosphere. It is situated on the coastal road mid-way between Kirkwall and Stromness, in the quiet village of Orphir. This makes it the perfect base to travel across the whole of the Mainland. There are two comfortable double en-suite bedrooms, one of which can be turned into a family room with an additional cot-bed or fold-down bed. We also welcome well behaved pets. Guests have the use of an exclusive living room, where there is a well-stocked fridge. They can help themselves to iced water, soft drinks, biscuits, sweeties, nuts and crisps. There is also the facility to make hot drinks. Additionally guests are welcome to watch television or a DVD, read or play various board games, which can be enjoyed, while taking in the stunning views over Scapa Flow. Parking is available on-site, making it easy to load the car and explore, when you wish. We can accommodate different breakfast options. After you have eaten, the day stretches ahead of you, with both ancient and modern sites of interest to visit. There are sandy and rocky beaches along with fabulous hill and coastal walks, which are just a short journey away. 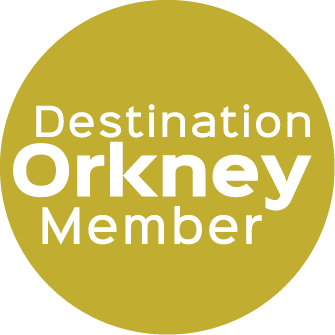 We are close to Houton terminal and the ferry that takes you to Hoy, where you can visit the Lyness Museum or you could drive to Rackwick Bay and walk to the Old Man, one of the most famous stacks in the world. Finally how about some bird watching in our garden or visit one of the RSPB Bird Reserves. Ask anything about where to visit we can help with ideas. We welcome you to our beautiful islands.